The highlight of my day was dinner on the patio of a restaurant on 2nd and a homeless man walked by talking to himself and everyone looked shocked or scared and one old man quickly said, "Oh don't worry, he's just talking on his bluetooth" It may be a little mean, but it definitely got a laugh out of me. I got it. Despite the not-so-good reviews. 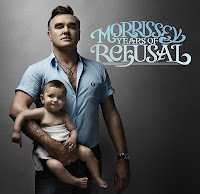 I actually really like it...It has this Old-Time vibe that I definitely am into lately..The only thing Morrissey about it is the dark and morbid lyrics. I dont know if it's the Valentines Day Curse, or the fact that it was Friday the 13th but the last couple of days have sucked. Friday: Had to work and deal with my stupid emotions regarding something stupid. Then I get in a car accident and smack my face on the steering wheel resulting in the worst headache ever. Saturday: Spend the majority of my day in Urgent Care for whiplash. Thanks to Mom for keeping me company. Monday: Rain...Rain...Rain... Found out something I'd rather ignore, ...Rain......Blah. I just want to erase today and I really dont want to work tomorrow...I'd rather spend all day in bed.